Kazakhstan with its capital Astana is located in Asia (Central Asia, northwest of China; a small portion west of the Ural (Zhayyq) River in easternmost Europe). It covers some 2,724,901 square kilometers (slightly less than four times the size of Texas) with a population of 18,556,700. Kazakh and Russian are the languages spoken by people in Kazakhstan. China, Kyrgyzstan, Russia, Turkmenistan and Uzbekistan are bordering countries. 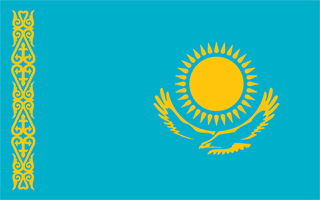 Kazakhstan is by far the largest of the Central Asian states of the former Soviet Union. Since its cold and windy weather conditions visiting saunas with friends is very popular in Kazakhstan. Saunas (Russian banyas or Finnish steam rooms) are an excellent place to discuss business issues or just socialize with friends. Having parties (birthdays, New Year, etc) in saunas is a normal practice. To reach someone Kazakhstan dial +7 prior to a number. The local cellular networks are operated on 900 MHz, 3G, 4G. Websites typically end with the top level domain ".kz". If you want to bring electric appliances (e.g. battery chaarger), keep in min the local 220 V - 50 Hz (plugs: C, F). The sign for the locally used currency Tenge is KZT. A gold sun with 32 rays above a soaring golden steppe eagle, both centered on a sky blue background; the hoist side displays a national ornamental pattern "koshkar-muiz" (the horns of the ram) in gold; the blue color is of religious significance to the Turkic peoples of the country, and so symbolizes cultural and ethnic unity; it also represents the endless sky as well as water; the sun, a source of life and energy, exemplifies wealth and plenitude; the sun's rays are shaped like grain, which is the basis of abundance and prosperity; the eagle has appeared on the flags of Kazakh tribes for centuries and represents freedom, power, and the flight to the future.